The Peacock Room, originally the dining room in the home of Frederick R. Leyland, was intended to showcase its owner's extensive collection of Chinese blue-and -white porcelain. Among his 300-plus pieces were examples similar to this vessel. Known as Kangxi ware, these pots were produced in the Jingdezhen region during the Kangxi reign (1662-1722). They became so popular with Victorian consumers that the press mockingly dubbed the craze "Chinamania." When Charles Lang Freer purchased the Peacock Room in London in 1904, it had already been emptied of its blue-and-white porcelains. Freer, in any case, did not care for their slick surfaces and bright glazes. Beginning in the 1980s, the Freer Gallery of Art began to acquire blue-and-whites for display in the Peacock Room, in an effort to evoke the chromatic relationships and pictorial patterns that inspired Whistler and his contemporaries. 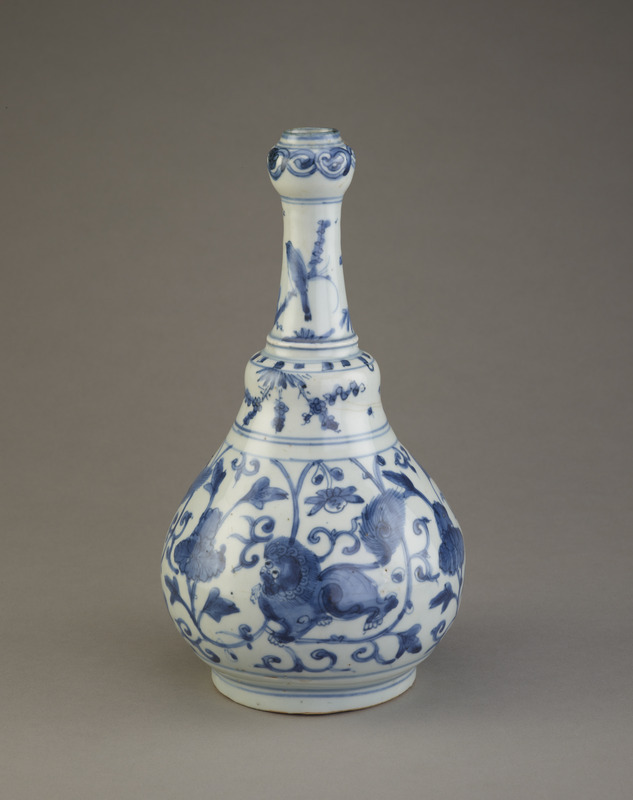 "Bottle," in The Peacock Room, Freer Gallery of Art, Smithsonian Institution, Accession No. F1992.33, Item #3170, http://www.peacockroom.wayne.edu/items/show/3170 (accessed April 19, 2019).